CHARLOTTE AMALIE – At least 1,000 Virgin Islands residents will take part in the 30th annual Ocean Conservancy International Coastal Cleanup Sept. 19 – Oct. 31. ridding the territory’s beaches of waste, from soda cans and plastic bags to tires and home appliances. 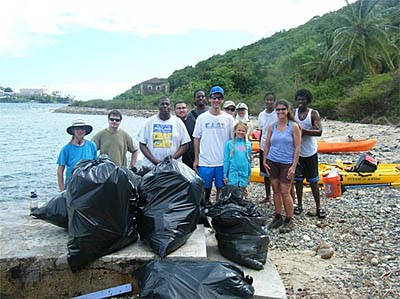 The Coastweeks cleanups on selected St. Thomas, St. Croix and St. John beaches are coordinated by the Virgin Islands Marine Advisory Services (VIMAS). VIMAS is a division within the University of the Virgin Islands Center for Marine and Environmental Studies program. VIMAS will assist groups, clubs, organizations and schools to organize and conduct shoreline and underwater cleanups. Sept. 19 – Brewers Bay 9 a.m.
Sept. 26 – Red Hook Salt Pond 8 a.m.
Oct. 3 – Coki Point 9 a.m.
On St. John beach clean ups are planned by community members who have adopted various beaches across the island, according to Karen Jarvis, who works with the Friends of the Virgin Islands National Parks and is a Coastweeks coordinator. One goal this year is to go beyond the shorelines and into the bushes surrounding the beaches, where he said there are larger items discarded by the public. “We have found anything from vials of blood, dishwashers, tires, washing machines and toilets,” Forbes said. VIMAS is partnering with The Virgin Islands Waste Management Authority (VIWMA), who will help transport and dispose of debris that is collected. Coastweeks is also going green this year. Rather than using paper forms to collect data and document waste accumulated, Forbes said information will now be input into a smart phone app. “The app has icons of cigarette butts, cans and other items waste collectors can click on. It helps tabulate specific waste collected and estimates the weight,” Forbes said. That data is returned to the Ocean Conservancy. Last year 10,000 pounds of trash was collected between St. Thomas, St. John and St. Croix. Teachers and other environmental groups are encouraged to participate in one of the scheduled Coastweeks cleanups, or schedule a cleanup of their own up to Oct. 31. For more information on scheduling a beach cleanup or other VIMAS related activities, visit http://vimas.uvi.edu or contact Forbes at (340) 693-1672 or howard.forbes@live.uvi.edu.